From the kitchens of DC greats, Komi and Little Serow, the responsible parties -- chef Jon Sybert; his wife, Jill Tyler; and friend/beverage director Bill Jensen -- know how to please DC diners. Shareable plates that resemble paintings just as beautiful to look at as the food is to eat, bring amusement and wonder to the eyes and the taste buds. A feat that can only be achieved from working at the best of the best. 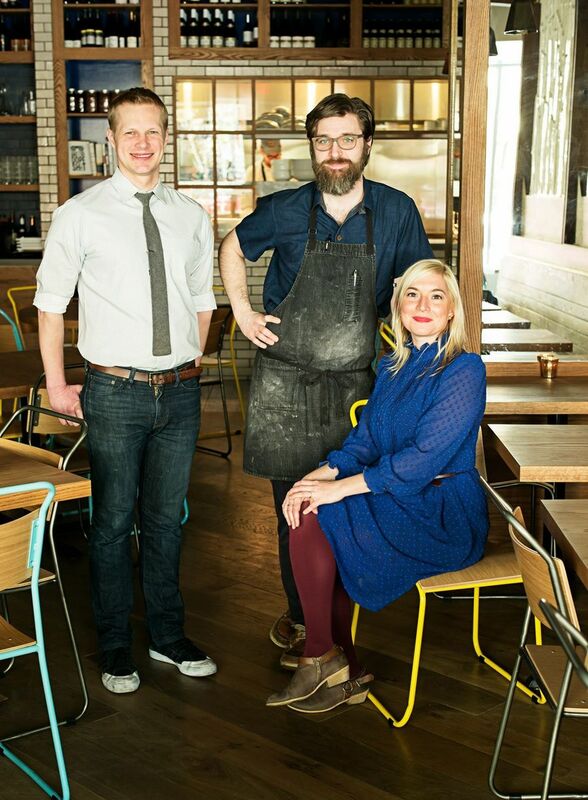 Left to right: Bill Jensen, owner and beverage director; Jon Sybert, owner and chef; Jill Tyler, owner and service director. Photo Courtesy of Scott Suchman. The dining room is full on a warm Tuesday evening, which is OK by me - I prefer the bar. There are plenty of bar seats open and the space is sparkling with votives, dim lighting and an open concept providing a window into the dining room. Just the kind of place I like to hang out in for a few hours. The bartender, Joaquin, greets me with a cocktail menu and water within minutes and I'm on my way to a fantastic evening. The cocktail menu is inventive, but not pretentious. I order something light and refreshing with a shrub involved. It was delicious, I ordered more. Then, it was time to EAT. These piping hot fritters were crispy and fluffy, yielding a salty, creamy salt cod adventure inside. Lucky for me (and you! ), the fritters are also sprinkled with finishing salt as soon as they left the fryer, melting onto the batter and creating a perfectly seasoned first taste. Each fritter was placed atop a smoky cauliflower puree, or what I like to call the cool down element. I was so hangry that I wanted to pop these hot fritters right in my mouth, and the puree enabled me to do that. The cherry on top was the pickled red onions; sour and sweet, they were a match made in heaven with the salty cod and the smoky puree. These are must when you visit. Oh my sweet Bugs Bunny. These little skewers of satisfaction were absolutely addicting. The house-made sausage was sweet and savory, which was heightened by the sweet fennel mostarda and bitter marinated radicchio. It's like the chef deconstructed the sausage mix-ins and added them in their pure form to the skewer. More delicious than I imagined it would be. Don't be afraid to eat rabbit, it's delicious and they had happy lives. If you skip one of the breads when you visit Tail Up Goat, you should just go directly home and hang your head in shame. The breads are made fresh in-house every day and you can taste the love. It's really hard to describe how mouth-wateringly delicious something so simple can be, but please trust me on this. First up was the brown rice bread with summer squash, yogurt, black garlic and benne seeds. The bread itself is toasted and buttery and warm and slightly crisp (not enough to cut the top of your mouth thank GOD), and piled high with just enough toppers to make it possible to fit everything in your mouth without looking like a complete idiot. There was tang from the yogurt, texture from the benne seeds, freshness from the lightly sauteed, super seasonal squash and a deep dark indulgence from the black garlic. The garlic was umami heavy and almost vinegary, with a roasted nutty finish...absolutely perfect. I felt a pang of jealousy and regret knowing I had to share this bread with three other people. The second bread was Seaweed Sourdough with pickled mussels, whipped lardo and sea beans. If that doesn't sound like a literal gold medal to you, I don't know what will. This bread is littered with luxury, starting with the whipped lardo that is slathered onto the the warm toasted seaweed sourdough with such generosity it should be illegal. The richness from the fatty lardo butter created sparks with the briny sour bread; but don't worry - those flavors from the baked slice of beauty were amplified with the sea beans and pickled mussels. Have you had pickled mussels yet?! They are an incredible new trend and my absolute favorite way to eat mussels. You can find my other favorite preparation of them at Range in Chevy Chase. Every tiny ingredient on this bread is a punch of flavor right to your pie hole. I personally couldn't choose a favorite but the combined scores of my fellow judges awarded the Brown Rice bread the gold and the Seaweed Sourdough the silver. Michael Phelps is happy with both, so you should be too. Just saying that word makes you think stretchy, right? Well just imagine stretching creamy mozzarella until little bits of it started snapping like a rubber band, creating chewy bits of texture. No it's not as chunky as cottage cheese (praise), but it's fun and exciting to eat. The stretched cheese is topped with juicy roasted peaches, peppery pea shoots, crunchy oat crumble, a sprinkle of pickled red onions and micro chive blossom confetti. This plate is the epitome of seasonal - eat it. As my bestie and dining companion said, "OMG the cheese dish was incredible! I thought it was such a perfect combination of sweet and tangy flavors and the oat crumbles were fun and crunchy." I think this was my favorite dish of the night. Gently braised potato wedges are adorned with glimmering salty trout roe gems and espelette pepper. Playing to the traditional celery component is roasted fennel stem and wisps of fresh dill. Pepitas swimming in thick creme fraiche make the dish sing. I loved it so much and ate 90% of it by myself. HI SUMMER! These tender toothsome homemade raviolis look exactly like the gold medal that they are. Filled with carrot puree, the sweet ravioli only get better as they swim in a creamy sauce of braised leeks, bits of apricot and adusting of crunchy pistachios and breadcrumbs. It's warm, buttery, chewy and sweet. A comfort food classic with the freshest explosion of seasonal ingredients. I also tried the fairy tale eggplant, which I'm not sure would have qualified in the Hangry Olympics. The roasted baby eggplants were a little bitter for me, as was the burnt bread sauce. With lots of crunchy za'atar and hazelnuts, I think it was just too much bitter in one bite. But I am all about that sweet corn! More of that, please. THE CANOLIS!!!!! THEY ARE EVERYTHING! First of all, every canoli should be this size - bite size. I think we can all agree that a full size canoli is too much for most to handle, that cream is SWEET. These super flaky and fresh shells were piped with the familiar canoli cream and a dollop of orange marmalade! Roasted pepitas are a fun replacement for chocolate chips and one bite was all I could have managed at the end of this incredible meal. There was also the ricotta toast with rhubarb rosemary jam. If I didn't think I would gain 50 lbs I would eat this for breakfast every day. Bread, cheese, jam... what could possibly be better? Also you should be making everything with rhubarb and rosemary before it's too late. Spectacular. I cannot express how much I love this place, the G.O.A.T., and my current favorite DC restaurant. The relaxing, buzzing atmosphere and exciting local, seasonal food is bound to keep DC diners coming back for more. The constantly changing menu shows dedication and creativity by chef Sybert, and I can't wait to see what he does next. Three Hangry Stars for Tail Up Goat!